Reputation marketing takes the five star reputation of a business and uses it to attract new customers, clients and patients. A comprehensive reputation suite includes creating, repairing, monitoring, managing and generating a reputation culture prior to marketing the online business reputation. There are a variety of questions that arise in conjunction with reputation services and so we thought we would create a resource to answer many of the common questions. Is it possible to remove negative reviews? This depends on the type of service you select, on the particular influence directory and the reviewer. In general, we only work moving forward when it comes to online reviews and testimonials. If you are a Reputation Power Suite subscriber, we do serve as an advocate for you and work to free filtered reviews. If a particular posting is suspect and against the terms of service, we have been successful in getting them removed in some cases. It is a labor intensive process and results vary due to the different variables. A minimum of 180 days is a reasonable commitment but ideally work should be ongoing. Will you be able to push down my negative online reviews? The best business reputation strategy results in the collection of more positive reviews. Once this is accomplished we market them so that they rise to the top and negative feedback gets pushed down. Positive reviews are showcased online and when combined with ranking strategies, negative reviews get pushed down. 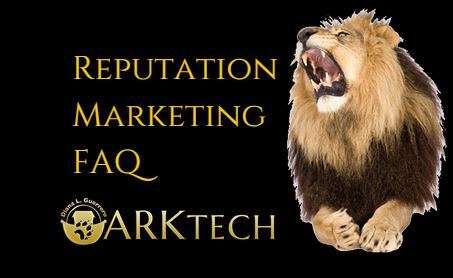 Due to the ever changing aspects of online marketing, it is important to continue reputation marketing efforts and to also take control online in order to resolve and mitigate any issues before they harm your business. What type of clients do you help? At this time we have worked with a variety of industries and business organizations (chambers, associations). ARKtech.Co has a special interest in working with a variety of companies but special interests include solar or green companies, environmentally conscious businesses, resort industries, and maritime (marinas, harbors). We enjoy working with a variety of companies if they are a good fit. In general, results are fairly quick but each client and situation is unique. A realistic time frame is determined after an initial consultation and research. Bad reputations take longer and are more complex than those that are good, or those that do not currently exist. Reputation efforts should be ongoing but at least a six to twelve month commitment is required. How much does reputation marketing and related efforts cost? At one time we only offered signature services by quote. Today we have subscription services that allow ongoing reputation service. Costs depend on the business and the reputation status. Some businesses only want to get things cleaned up or started, others may just want staff training, while others might want only a monitoring option. Basic monitoring with alerts may start at a low rate of under $100 per month for up to ten sites while a comprehensive analysis, creation, clean up (fixing), mitigation, monitoring, and marketing can run into the thousands. Can you keep this work confidential? As a general rule clients are kept confidential. We may use data for an anonymous case study or, when beneficial to others, request permission to use some information for education purposes. Of course, if a client leaves a review or testimonial, or allows us to use the business website in our portfolio, that will be public. Will I receive reputation reports? We monitor your business reputations and create internal reports regularly but find most businesses don’t want to be overwhelmed with data. We do send out alerts and can also send out regular reports on developments. Reputation progress reports can be sent out monthly but a strategic update is generally provided at six months. Business access to the new customer review management panel allows businesses to check their status when they desire an update. Can you help with Yelp reviews? It depends, yes and no. In the past, if the review is in violation of Yelp’s guidelines (personal attacks, are not first-hand experience, or are irrelevant) we usually were successful. Today, Yelp (and other review sites) are less responsive even if a review is a blatant guideline violation or again posted Terms of Service. Guidelines are also fluid as sites update and change them frequently. Yes, we offer a comprehensive list of options depending on your unique business needs. We offer long-term strategies and offer better rates on services and add-ons are available to those on annual pre-pay or annual subscriptions. Recently we began to offer stand-alone options for review monitoring & alerts, the reputation training center for staff, customer review videos, and other new offers. Recurring payment profiles using corporate credit card is preferred and annual prepayments qualify for special incentives. Other options include Paypal subscription or recurring payments agreements. In some cases monthly payment authorizations via ACH are available upon request. If you have a special request, please let us know during discussions about service. If you’d like more information contact our reputation marketing division.